YAY!! Look at our pretty new Catalano display. 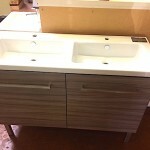 As you see it, it is 48″ wide with TWO bowls which is a rarity in a 48″ vanity. This size and finish is stocked in the United States so we should be able to have it in about 3 weeks. The finish is easy to clean and maintain. 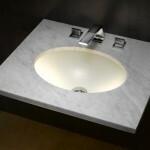 And it is designed in Italy. 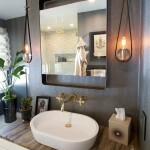 It’s clean and modern in style but with a not so modern faucet, it could be very transitional.